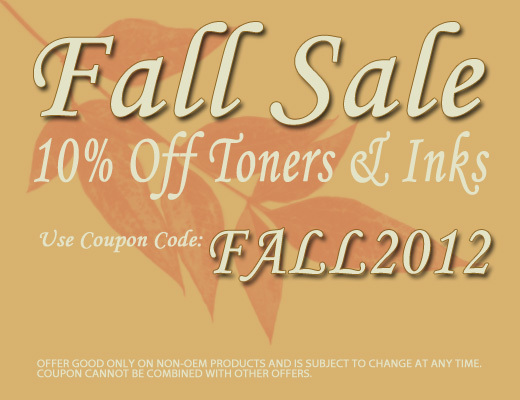 TonerGreen Fall Sale - 10% Off Toners and Inks | TonerGreen - Eco-Friendly Toners from the U.S.
With the cool breeze starting to permeate the air and the leaves slowly turning into shades of red, orange and yellow, no doubt, the fall season has arrived. And to kick off the start of this season, TonerGreen, a leader in providing environmentally responsible printing solutions, is offering this year's Fall Sale to all our shoppers, allowing them to save up to 10% on their orders of toners and inks. TonerGreen's Fall Sale gives everyone a chance to save on their printing expenses when you buy our remanufactured ink cartridges and toner cartridges. Get 10% off discount on all our inks and toners by just keying in the coupon code FALL2012 at the checkout page to avail this promo. Plus, for all orders $50 or more, shipping is free. So what are you waiting for? Start stacking up on your printer supplies because this promo ends on September 23. This offer is good on non-OEM products and cannot be combined with other coupon codes. And other brands like Apple, IBM, Pitney Bowes, Toshiba, Ricoh, Gestetner, Source Technologies and Kodak. With our products, you are 100% sure to get the best printouts from your printers!